What is a 24-Team Double-Elimination Bracket? A 24 team bracket doesn’t work out as evenly as a 4, 8, 16, 32, or 64 team tourney would. In addition to an even number of teams, there needs to be an equal number of brackets as teams advance into the following rounds. For twenty-four competing teams, there would be an odd number of winning teams moving into the next round, which means one team would not have a match up. Our double-elimination, twenty-foud team downloadable brackets comes in a variety of options! You can download and print them out in PDF, full-size image or in Excel. With our brackets, they’re not limited to just basketball or baseball tournaments. 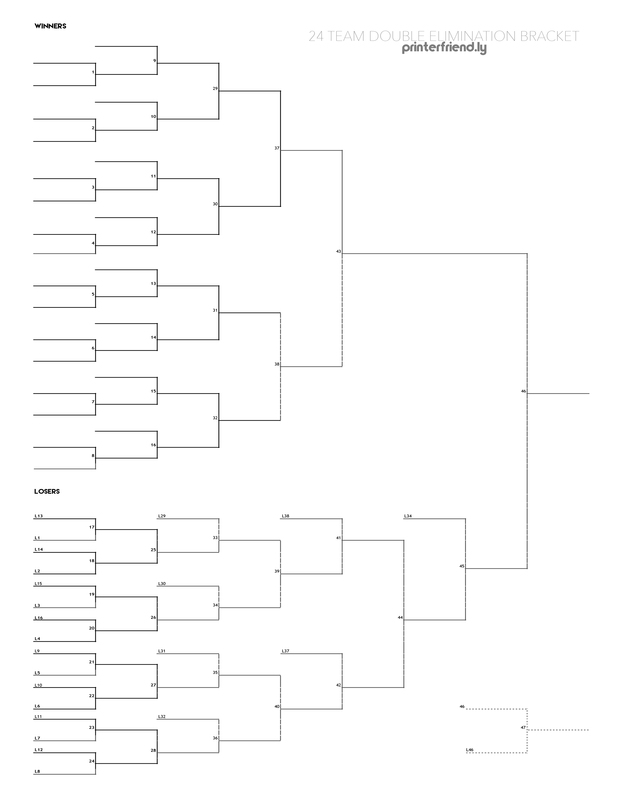 As long as the tournament is double-elimination then our printable, blank brackets will work with any tournament. For 24-team single elimination tournaments, click here for that bracket.